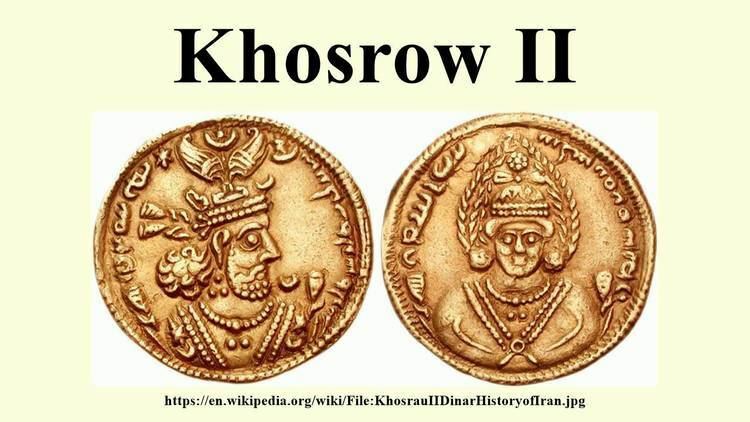 Khosrow II (Chosroes II in classical sources; Middle Persian: Husrō(y)), entitled "Aparvēz" ("The Victorious"), also Khusraw Parvēz (New Persian: خسرو پرویز), was the last great king of the Sasanian Empire, reigning from 590 to 628. He was the son of Hormizd IV (reigned 579–590) and the grandson of Khosrow I (reigned 531–579). He was the last king of Persia to have a lengthy reign before the Muslim conquest of Iran, which began five years after his death by execution. He lost his throne, then recovered it with Roman help, and, a decade later, went on to emulate the feats of the Achaemenids, conquering the rich Roman provinces of the Middle East; much of his reign was spent in wars with the Byzantine Empire and struggling against usurpers such as Bahram Chobin and Vistahm. During the climactic Byzantine–Sasanian War of 602–628, Khosrow expanded deep into western Asia Minor, eventually besieging the Byzantine capital of Constantinople in 626 alongside Avar and Slavic allies. Following the failure of the siege, Heraclius started a counterattack, undoing all territorial gains by Khosrow in the Levant, most of Anatolia, the western Caucasus, and Egypt, eventually marching into the Sassanian capital of Ctesiphon. The Byzantines also regained the True Cross, which Khosrow had captured following his conquest of the Levant during the same 602–628 war. 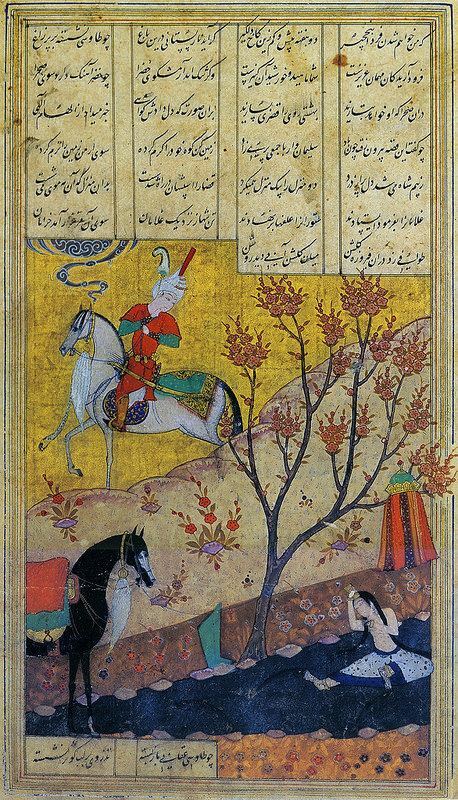 In works of Persian literature such as the Shahnameh and Khosrow and Shirin, a famous tragic romance by Nizami Ganjavi (1141–1209), a highly elaborated fictional version of Khosrow's life made him one of the greatest heroes of the culture, as much as a lover as a king. Khosrow and Shirin tells the story of his love for the Aramean or Roman princess Shirin, who becomes his queen after a lengthy courtship strewn with mishaps and difficulties. Khosrow II was born around 570; his father was Hormizd IV and his mother was from the House of Ispahbudhan from Gurgan; his mother's two brothers named Vinduyih and Vistahm were to have a profound influence in Khosrow II's early life. Khosrow is first mentioned in the 580s, when was at Partaw, the capital of Caucasian Albania. During his stay there, he served as the governor of the kingdom, and managed to put an end to the Kingdom of Iberia and make it into a Sasanian province. Furthermore, Khosrow II also served as the governor of Arbela around this period. 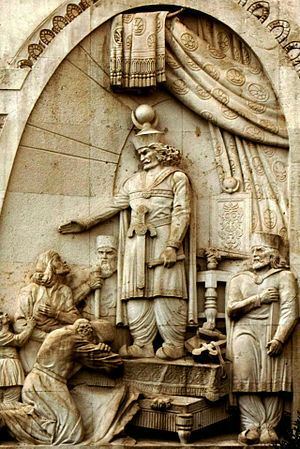 Excelling most of the other Persian kings in bravery, wisdom and forethought, and none matching him in military might and triumph, hoarding of treasures and good fortunes, hence the epithet Parviz, meaning victorious. According to a legend, Khosrow had a shabestan in which over 3,000 concubines resided. Khosrow was raised to the throne by his two uncles Vistahm and Vinduyih, who were the leaders of a palace coup that deposed, blinded and killed Hormizd IV. However, at the same time, the Mihranid spahbed Bahram Chobin, was marching towards the Sasanian capital of Ctesiphon, and battle shortly ensued near the city on 28 February, which ended in Khosrow's defeat and his flight to Byzantine territory along with his two uncles. In order to get the attention of the Byzantine emperor Maurice (r. 582–602), Khosrow II went to Syria, and sent a message to the Sasanian occupied city of Martyropolis to stop their resistance against the Byzantines, but with no avail. He then sent a message to Maurice, and requested his help to regain the Sasanian throne, which the Byzantine emperor agreed with; in return, the Byzantines would re-gain sovereignty over the cities of Amida, Carrhae, Dara and Miyafariqin. Furthermore, Persia was required to cease intervening in the affairs of Iberia and Armenia, effectively ceding control of Lazistan to the Byzantines. In 591, Khosrow moved to Constantia, and prepared to invade the Sasanian controlled part of Mesopotamia, while Vistahm and Vinduyih were raising an army in Adurbadagan under the observation of the Byzantine commander John Mystacon, who was also raising an army in Armenia. After some time, Khosrow along with the Byzantine commander of the south, Comentiolus, invaded Mesopotamia. During this invasion, Nisibis and Martyropolis quickly defected to them, and Bahram's commander Zatsparham was defeated and killed. During the same period, Khosrow, feeling disrespected by Comentiolus, convinced Maurice to replace the latter with Narses as the commander of the south. Khosrow and Narses then penetrated deeper into Bahram's territory, seizing Dara and then Mardin on February, where Khosrow was re-proclaimed king. Shortly after this, Khosrow sent one of his Iranian supporters, Mahbodh, to capture Ctesiphon, which he managed to accomplish. Meanwhile, Khosrow's two uncles and John Mystacon, conquered northern Adurbadagan, and went further south in the region, where they defeated Bahram at Blarathon, who fled the Turks of Ferghana. However, Khosrow managed to deal with him by either having him assassinated or convince the Turks to execute him. Peace with the Byzantines was then officially concluded. For his aid, Maurice received much of Persian Armenia and western Georgia (Colchis-Abkhazia), and received the abolition of the subsidies which had formerly been paid to the Sasanians. After his victory, Khosrow rewarded his uncles with high positions: Vinduyih became treasurer and first minister and Vistahm received the post of spahbed of the East, encompassing Tabaristan and Khorasan, which was the traditional homeland of the Ispahbudhan. Soon, however, Khosrow changed his intentions: trying to disassociate himself from his father's murder, he decided to execute his uncles. The Sasanian monarchs' traditional mistrust of over-powerful magnates and Khosrow's personal resentment of Vinduyih's patronising manner certainly contributed to this decision. Vinduyih was soon put to death, according to a Syriac source captured while trying to flee to his brother in the East. At the news of his brother's murder, Vistahm rose in open revolt. According to Dinawari, Vistahm sent a letter to Khosrow announcing his claim to the throne through his Parthian (Arsacid) heritage: "You are not worthier to rule than I am. Indeed, I am more deserving on account of my descent from Darius, son of Darius, who fought Alexander. You Sasanians deceitfully gained superiority over us [the Arsacids] and usurped our right, and treated us with injustice. Your ancestor Sasan was no more than a shepherd." Vistahm's revolt, like Bahrams's shortly before, found support and spread quickly. Local magnates as well as the remnants of Bahram Chobin's armies flocked to him, especially after he married Bahram's sister Gordiya. Vistahm repelled several loyalist efforts to subdue him, and he soon held sway in the entire eastern and northern quadrants of the Persian realm, a domain stretching from the Oxus river to the region of Ardabil in the west. He even campaigned in the east, where he subdued two Hephthalite princes of Transoxiana, Shaug and Pariowk. The date of Vistahm's uprising is uncertain. From his coinage, it is known that his rebellion lasted for seven years. The commonly accepted dates are ca. 590–596, but some scholars like J.D. Howard–Johnston and P. Pourshariati push its outbreak later, in 594/5, to coincide with the Armenian Vahewuni rebellion. As Vistahm began to threaten Media, Khosrow sent several armies against his uncle, but failed to achieve a decisive result: Vistahm and his followers retreated to the mountainous region of Gilan, while several Armenian contingents of the royal army rebelled and defected to Vistahm. Finally, Khosrow called upon the services of the Armenian Smbat Bagratuni, who engaged Vistahm near Qumis. During the battle, Vistahm was murdered by Pariowk at Khosrow's urging (or, according to an alternative account, by his wife Gordiya). Nevertheless, Vistahm's troops managed to repel the royal army at Qumis, and it required another expedition by Smbat in the next year to finally end the rebellion. Khosrow II's reign was considered a golden age in music. Before Khosrow II there were many other Sasanian kings that showed particular interest in music, like Khosrow I, Bahram Gur, and even Ardashir I. Notable musicians during the reign of Khosrow II were Barbad (Khosrow's favorite court musician), Bamshad, Sarkash, and Nagisa. Khosrow II married a Christian named Shirin, whose son Mardanshah he wanted to succeed to the throne. Khosrow's relationship to Christianity was complicated: his wife Shirin was Christian, and so was Yazdin, his minister of finance. During his reign there was constant conflict between Monophysite and Nestorian Christians. Khosrow favored the Monophysites, and ordered all his subjects to adhere to Monophysitism, perhaps under the influence of Shirin and the royal physician Gabriel of Sinjar, who both supported this faith. Khosrow also dispensed money or gifts to Christian shrines. Khosrow's great tolerance to Christianity and friendship with the Christian Byzantines even made some Armenian writers think that Khosrow was a Christian. His positive policy toward Christians (which, however, was probably politically motivated) made him unpopular with the Zoroastrian priests, and also made Christianity greatly spread around the Sasanian Empire. However, Khosrow also paid attention to the Zoroastrians, and built various fire temples. But this did not help the Zoroastrian church, which was in a heavy decline during the reign of Khosrow, which, in the words of Richard N. Frye, "was noted for its devotion to luxury more than its devotion to thought." 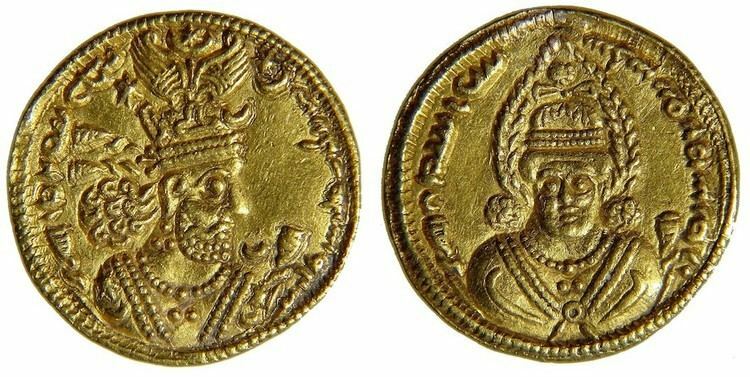 In 600, Khosrow II executed Al-Nu'man III, King of the Lakhmids of Al-Hira, presumably because of the Arab king's refusal to give him his daughter al-Ḥurqah in marriage and insulting Persian women. Afterwards the central government took over the defense of the western frontiers to the desert, and the buffer state of the Lakhmids vanished. This ultimately facilitated the Muslim Caliphs' invasion and conquest of Lower Iraq, less than a decade after Khosrow's death. Toward the beginning of his reign, Khosrow II had good relations with the Byzantines. However, when in 602 Maurice was murdered by his General Phocas (602–610), who usurped the Roman (Byzantine) throne, Khosrow launched an offensive against Constantinople: ostensibly to avenge Maurice's death, but his aim clearly included the annexation of as much Byzantine territory as was feasible. Khosrow II, along with Shahrbaraz and his other best generals, quickly captured Dara and Edessa in 604, and recaptured lost territory in the north, which made the Sasanian–Byzantine borders go back to the pre-591 frontier before Khosrow gave Maurice territory in return for military aid against Bahram Chobin. After having reclaimed lost territory, Khosrow withdrew from the battlefield and handed military operations to Shahrbaraz and Shahin Vahmanzadegan. The Sasanian armies then invaded and plundered Syria and Asia Minor, and in 608 advanced into Chalcedon. 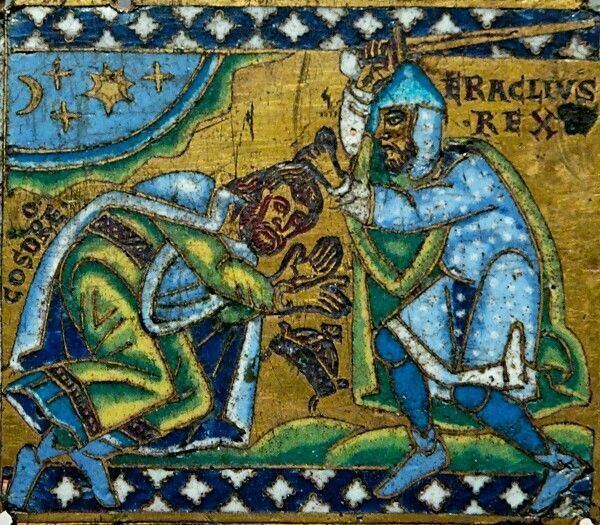 In 610, Heraclius, an Armenian, revolted against Phocas and killed him, crowning himself as Emperor of the Byzantine Empire. He then tried to negotiate peace with Khosrow II by sending diplomats to his court. Khosrow, however, rejected their offer and said: "That kingdom belongs to me, and I shall enthrone Maurice's son, Theodosius, as emperor. [As for Heraclius], he went and took the rule without our order and now offers us our own treasure as gifts. But I shall not stop until I have him in my hands." Khosrow then had the diplomats executed. In 613 and 614, General Shahrbaraz besieged and captured Damascus and Jerusalem, and the True Cross was carried away in triumph. Soon afterwards, Shahin marched through Anatolia, defeating the Byzantines numerous times; he conquered Egypt in 618. The Byzantines could offer but little resistance, as they were torn apart by internal dissensions, and pressed by the Avars and Slavs, who were invading the Empire from across the Danube River. In 622/3, Rhodes and several other islands in the eastern Aegean fell to the Sasanians, threatening a naval assault on Constantinople. Such was the despair in Constantinople that Heraclius considered moving the government to Carthage in Africa. In ca. 606/607, Khosrow recalled Smbat IV Bagratuni from Persian Armenia and sent him to Iran to repel the Turko-Hephthalites, who had raided as far as Spahan in central Iran. Smbat, with the aid of a Persian prince named Datoyean, repelled the Turko-Hephthalites from Persia, and plundered their domains in eastern Khorasan, where Smbat is said to have killed their king in single combat. Khosrow then gave Smbat the honorific title Khosrow Shun ("the Joy or Satisfaction of Khosrow"), while his son Varaztirots II Bagratuni received the honorific name Javitean Khosrow ("Eternal Khosrow"). In 622, nevertheless with the Sasanians making major progress in the area of the Aegean Sea, the Byzantine Emperor Heraclius was able to take the field with a powerful force. In 624, he advanced into northern Adurbadagan, where he was welcomed by Farrukh Hormizd, and his Rostam Farrokhzad who had rebelled against Khosrow. Heraclius then began sacking several cities and temples, including the Adur Gushnasp temple. Several years later, in 626, he captured Lazistan (Colchis). Later that same year, Shahrbaraz advanced on Chalcedon on the Bosphoros and attempted to capture Constantinople with the help of Persia's Avar and Slavic allies. In this siege of Constantinople in 626, the combined Sassanid, Slavic and Avar forces failed to capture the Byzantine capital city. The Avars did not have the patience or technology to conquer the city. On top of that, the Persians, who were siege warfare experts, were unable to transport their troops and equipment to the other side of the Bosphorus where their Slavic and Avar allies were located, due to heavy guarding of the strait by the Byzantine navy. Furthermore, the walls of Constantinople easily defended against the siege towers and engines. Another reason was that the Persians and Slavs did not have a strong enough navy to ignore the sea walls and establish a channel of communication. The lack of supplies for the Avars eventually caused them to abandon the siege. As this maneuver failed, his forces were defeated, and he withdrew his army from Anatolia later in 628. Following the Third Perso-Turkic War in 627, Heraclius defeated the Persian army at the Battle of Nineveh and advanced towards Ctesiphon. Khosrow II fled from his favourite residence, Dastagird (near Ctesiphon), without offering resistance. Heraclius then captured Dastagird and plundered it. After the capture of Dastagird, the son of Khosrow, Kavadh, was released by the feudal families of the Sasanian Empire, which included: The Ispahbudhan spahbed Farrukh Hormizd and his two sons Rostam Farrokhzad and Farrukhzad. Shahrbaraz of Mihran family, the Armenian faction represented by Varaztirots II Bagratuni, and finally Kanadbak of the Kanārangīyān family. On 25 February, Kavadh, along with Aspad Gushnasp, captured Ctesiphon and imprisoned Khosrow II. Kavadh II then proclaimed himself as king of the Sasanian Empire, and ordered Piruz Khosrow to execute all his brothers and half-brothers, which included Mardanshah, the favorite son of Khosrow II. Three days later, Kavadh ordered Mihr Hormozd to execute his father (some sources state that he was shot to death slowly with arrows). With the support of the Persian nobles, Kavadh then made peace with the Byzantine emperor Heraclius, which made the Byzantines regain all their lost territories, their captured soldiers, a war indemnity, along with the True Cross and other relics that were lost in Jerusalem in 614. Heraclius then returned in triumph to Constantinople, while the Sasanian Empire sank into anarchy from the greatness it had reached ten years earlier. From Muhammad, the Messenger of Allah, to Kisra, the great (leader/head) of the Persians. Peace be upon him, who seeks truth and expresses belief in Allah and in His Prophet and testifies that there is no god but Allah and that He has no partner, and who believes that Muhammad is His servant and Prophet. Under the Command of Allah, I invite you to Him. He has sent me for the guidance of all people so that I may warn them all of His wrath and may present the unbelievers with an ultimatum. Embrace Islam so that you may remain safe (in this life and the next). And if you refuse to accept Islam, you will be responsible for the sins of the Magi." Islamic tradition further states that Khosrow II tore up Muhammed's letter saying, "A pitiful slave among my subjects dares writes his name before mine" and commanded Badhan, his vassal ruler of Yemen, to dispatch two valiant men to identify, seize and bring this man from Hijaz (Muhammad) to him. When Abdullah ibn Hudhafah as-Sahmi told Muhammad how Khosrow had torn his letter to pieces, Muhammad promised the destruction of Khosrow II stating, "Even so, shall Allah destroy his kingdom. "His words were true as shortly thereafter, the Persian army faced defeat at the hands of the Romans. The battles between Heraclius and Khosrow are depicted in a famous early Renaissance fresco by Piero della Francesca, part of the History of the True Cross cycle in the church of San Francesco, Arezzo. Many Persian miniature paintings depict events in his life, like his battles or his assassination. Khosrow was the son of Hormizd IV, and an unnamed Ispahbudhan noblewoman who was the sister of Vistahm and Vinduyih. Khosrow also had two cousins from the Ispahbudhan family whom were named Mah-Adhur Gushnasp and Narsi. He had a brother-in-law named Hormuzan, a Sasanian nobleman from one of the seven Parthian clans, who later fought against the Arabs during the Muslim invasion of Persia. However, this is most likely wrong since Kavadh's mother was a Byzantine princess named Maria. Khosrow married three times: first to Maria, a daughter of the Byzantine emperor Maurice, who bore him Kavadh II. Then to Gordiya, the sister of Bahram Chobin, who bore him Javanshir. Then to Shirin, who bore him Mardanshah. 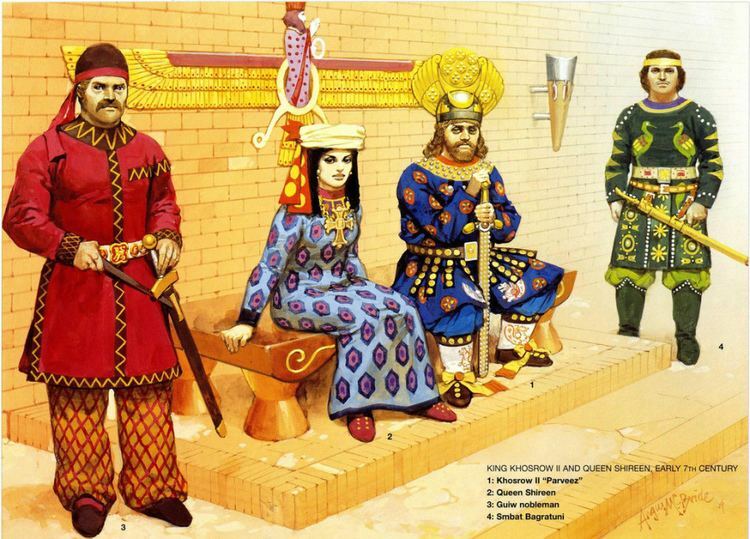 Khosrow also had other children whom were named: Borandukht, Azarmidokht, Shahriyar and Farrukhzad Khosrow V. All these persons except Shahriyar would later become the monarch of Persia during the Sasanian civil war of 628–632. Khosrow had a brother named Kavadh and a sister named Mirhran, who was married to the Sasanian spahbed Shahrbaraz, and later bore him Shapur-i Shahrvaraz, while Kavadh married an unnamed woman who bore him Khosrow III.